In this final video of the series, I demonstrate playing with electronic effects. I am using a regular digitec pedal board. There are so many effects and combinations that are available, I can only show the tip of the iceberg, or is it the volcano. In this video, I am going for serious effects. I use two basic standard styles, single bell tones, making a full accompaniment out a single melodic line, and and full driving rhythms that create a cummulative effect as the beats and notes cascade through the effects box. Sometimes it sounds a lot like one or two thrashing elecric guitars, other times it is something different, thrashing electric hammered dulcimer. 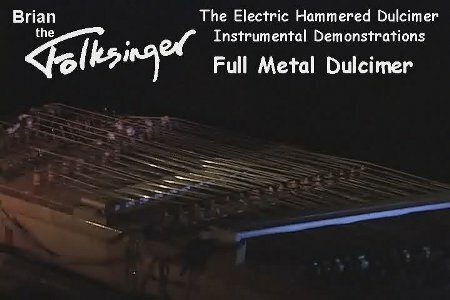 I finish again by saying that I am only giving a taste of the potential in the electric hammered dulcimer. Effects themselves are a whlole world, from full on to subtle use, and it still comes down to how you use it in the mix, how you use it in a song, not just an effect. This video is also special because I have no recordings yet of me playing this type of heavy electric music. Its been in the works for over a decade, and it has always been part of what I do. Though for a long time I was playing acoustic, which meant not a lot of effects like this. And really, I am still just trying to get out the first recordings in the list. The CD I've done so far was more acoustic-oriented in sound, and I have so much material that I want to focus each recording generally so people can get the one or ones that match their interest. I am presently working on at least a couple CDs of originals and trying to find musicians to work with in the process, and I'd like to have a band sound for at least some of the heavy electric dulcimer recordings, drum and bass and lead guitar. But now I struggle just to get what I can get done solo, to tell the truth. This entry was posted on Wednesday, April 28th, 2010 at 5:16 am	and is filed under The Electric Hammered Dulcimer. You can follow any responses to this entry through the RSS 2.0 feed. Both comments and pings are currently closed.